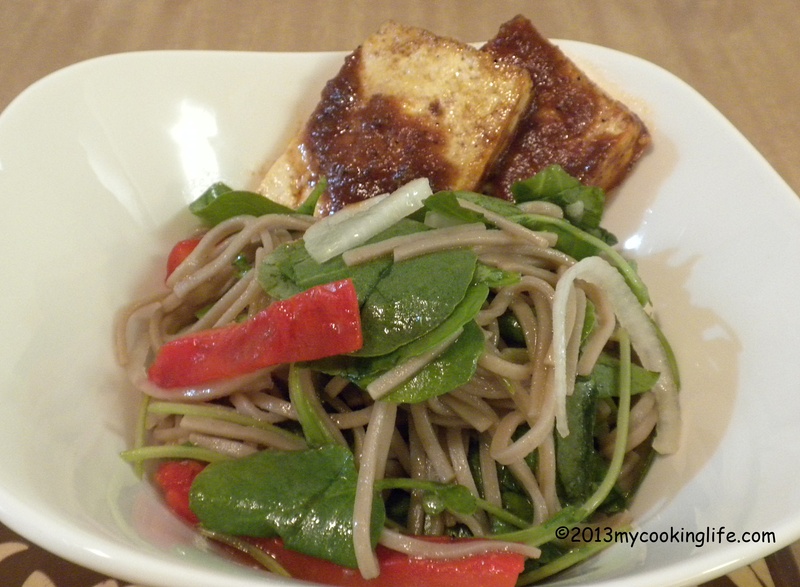 Cold soba salad served with a couple slices of barbecued tofu. The roasted pepper is easy squeasy. Turn on your burner if you have a gas stove and put a whole cleaned red pepper over a low flame. Turn the pepper occasionally to get all sides blackened. Put your roasted pepper in a paper bag and let it sweat. Then peel and slice—mmm good! No gas stove? Try the broiler. I made my dressing with juice of two lemons, some umeboshi vinegar (a salty and sour vinegar made from a pickled plum—typically a Japanese condiment), some toasted sesame oil, some mirin and some garlic. Toss it all together and chill. Takes about 10 mins. Don’t have or don’t like these ingredients? No worries! Substitute with whatever sounds good to you and enjoy. This entry was posted in Recipes, Vegan and tagged how to roast a pepper, Japanese cuisine, mirin, Sesame oil, Soba, umeboshi vinegar, Watercress by mycookinglifebypatty. Bookmark the permalink. Was just contemplating what to make with some leftover tofu tonight. This may be a possibility, Patty! We even have a red pepper. No watercress, but lots of other possible greens. Thank you! You could put just about anything in this Kathy! And the leftovers were delicious too! It was good as leftovers and gone very fast! Thanks for stopping by.